Spend the morning or afternoon perusing the great collections at the Beaverbrook Art Gallery. Browse on your own, or take advantage of a summer drop in tour! Either way, it’s a great way to delve into the world of art in its many forms. Encourage your kids to bring a sketch pad and pencil and attempt to recreate what they see! Reward them for their efforts with a sweet treat or coffee for yourself at the Café Beaverbrook by Chess Piece! Nothing beats cracking open a good book on a rainy day. Fredericton is blessed with two great libraries: one downtown and one on the north side. Our downtown library is full of all kinds of cozy spots to settle down with a book with a lovely view of the river and trails, as well as great spaces for kids. Hanging out at the library is a great way to relax during the summer months, and it’s an even greater option if the weather is wet! There’s always something going on at the library, from book clubs, art workshops & more, so check with them to find out what’s going on! Better yet, make the library one of your first stops to stock up on reading material before visiting a local café to waste a rainy afternoon. 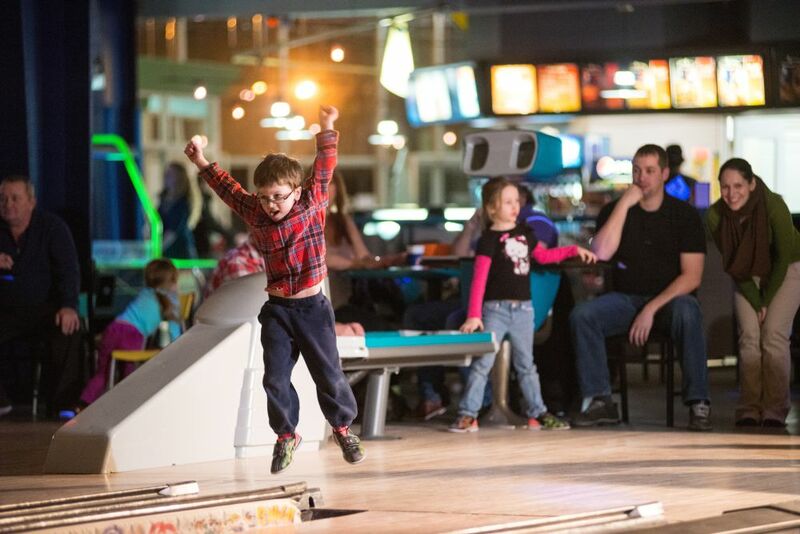 Besides all of the cool arcade games, playclimber and laser tag, Kingswood has “10 Buck Bowling” (one lane for an hour, 4 bowlers/lane, shoes not included) all summer long! Don’t forget that Kingswood also has a 45 foot inflatable obstacle course! This café is New Brunswick’s first “paint-your-own” pottery studio. It is a great spot to be creative, with over 300 difference pieces to choose from. Located at 356 Queen Street, no reservations are needed. Pieces take anywhere from 5-7 days to allow for glazing and kiln firing (that’s how you get that “glossy” finished product look!). Weekends tend to be quite busy, so get there early or choose a weekday where it is not too busy. Caution: this hobby can be quite addictive! I brought my two kids and we spent almost 3 hours, painstakingly perfecting our masterpieces! You can always stop your progress and save your piece for the next rainy day – at no extra charge! Home to the famous “Coleman Frog,” the Fredericton Region Museum is a great spot to visit, featuring exhibits as well as providing an interesting way to learn about the Fredericton region. In addition to the main exhibits, kids can play dress up with different stations around the museum! New this year is a First Nations Gallery and Confederation Exhibit that will be available for the summer. Also learn about the Wabanaki people, Acadians, military and more! This interactive museum hosts a number of galleries featuring exhibits and memorabilia related to New Brunswick sports history and its Hall of Famers. One of the largest portrait collections in the province is on display in the form of artistic depictions of the hall's inductees. A 5-in-1 interactive sports system allows visitors to give it their best shot while playing basketball, hockey, football, baseball or soccer and a Biomechanics and Sports Discovery Centre can also be enjoyed at the NB Sports Hall of Fame. Activities and special events are held throughout the year. Guided tours are available. Another classic rainy day activity is board games! Unplugged Board Games Cafe is a great way to get out of the house for some family fun and a little friendly competition! With a wide variety of party games, trivia games, family games, kid’s games, strategy games, and more, there’s something for everyone to enjoy! And while you’re there, make sure to order one of their great sandwiches! Red Rock Adventure at The Ville Cooperative, 241 Canada St, Tel: 472-7799 - Open Climb is held on Wednesdays from 6-8pm and Family Climbs are held on Saturdays from 10am – 1pm. Check the website for details. Suitable for kids age 6+. CFB Gagetown Climbing Wall, Oromocto, Tel: 422-3380- The club operates out of the Base Fieldhouse. The Gym offers 11 + lanes of climbing walls, two of which are lead climb capable and two lead practice. All walls are in excess of 30 ft high. What are Escape Rooms you ask? Imagine you and your friends, or strangers are locked in a room and must figure out how to escape within 60 minutes. There are puzzles and clues hidden throughout the room for you to discover with your senses. Can you solve the puzzle with the help of clues, and your friends before the time is up? And these are just a couple of the great ideas on things to do in Fredericton – if the weather improves make sure to get outside and check out our website for some great ideas! And let us know how you make out!